I should add that I was very grateful to have my kids babysat so we could have some time out at the flicks. It was fun and very enjoyable and relaxing! Not been to the cinema for a while. Gosh, it’s just one long series of dark patterns designed to make you spend money on anything but watching a film. Surprised the toilets were free tbh. Product idea: an app that crowdsources the ACTUAL start time of movies at the cinema. I have seen “The Last Jedi”. I think, overall, it was a bit too random. Or maybe there was a ton of stuff that I just didn’t get. As Facebook lowers reach of un-paid page posts, Facebook actually becomes LESS relevant for me. Seriously wouldn’t miss it right now. Enjoying the micro.blog and blogging community again. Product idea: hirsute-friendly event admission wristbands. Oh, and RESULT! Today I modified a webpack config, and I actually almost knew what I was doing! And I made it do something useful! ??? I’m supposed to be doing my tax return, but I’m coping and pasting content into a blog post instead. There’s really not much else you can do. Clever people are working to fix this. You’ll need to trust the experts and just run the updates when they come out! I’m resident tech person for many, so…about these processor issues you’re seeing in the news: These are issues with your “hardware”. It’s like having a design flaw in the engine of your car that causes it to leak oil. The real fix is to buy a new car (or replace the engine). Wasn’t sure how I was going to fit my little video course UI onto mobile, but I think this is a neat little solution that didn’t take too much CSS. I’m really, really, definitely no designer, but I’m trying to build a little dashboard for watching the Laravel videos and tracking progress…IN Laravel of course. 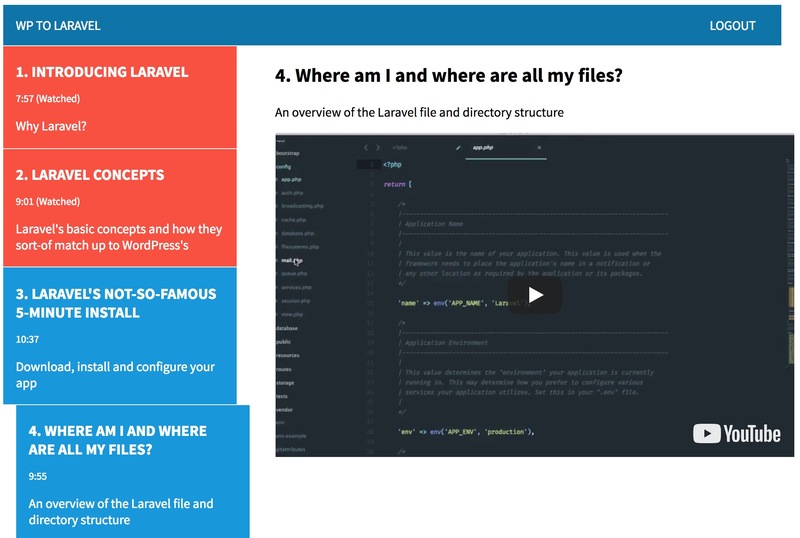 Finally recorded the last of my WP to Laravel videos yesterday. Phew! Just some editing and polishing to do. I hope it’s useful to people. Actually…nah. I’m not gonna take a selfie. But it was fun thinking about it. Anyone that’s known me for more than about 5 minutes will know that I care VERY little for fashion. But I got this super-smart new coat in the sales and I LOVE it and am quite excited about it. I might even take a selfie!